According to the Bureau of Labor Statistics, nearly 50 million Americans spend at least 20% of their time working in office settings. Office workers run the risk of overall low-activity lifestyles: Research suggests that people who sit in offices all day don’t compensate for their work-day inactivity with exercise outside of work. The potential health consequences are even clearer when you consider that sedentary lifestyles are associated with increased risk of cardiovascular disease and other negative health outcomes. But how do these associations play out in workers’ everyday lives? 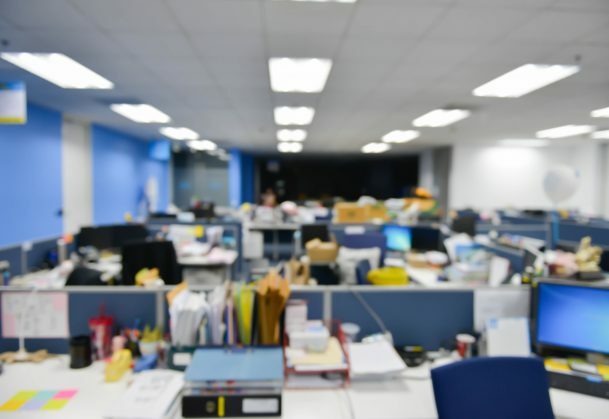 Psychological scientist Casey Lindberg and coauthors were interested in examining how different types of office environments are related to employees’ short-term health outcomes. Previous research has linked specific office environments with workplace-related illnesses and stress, but these researchers wanted to use objective measurements of both activity and stress indicators to explore how different types of workplace arrangements are linked with employee wellbeing. Although this type of study might have been limited to lab-based experiments and self-report surveys in the past, the digital tools afforded by smartphones and activity trackers allow researchers to study real-world behavior as it happens in the moment. As psychological scientist Gabriella Harari and coauthors note in an article in Perspectives on Psychological Science, today’s phones are outfitted with accelerometers, GPS, light sensors, microphone sensors, Wi-Fi sensors, messaging and app capabilities, all of which can be useful in psychological research. Taking advantage of these new digital tools, Lindberg and colleagues outfitted 231 employees in the US General Services Administration (GSA), a US government agency, with activity trackers and heart rate monitors over 3 days and 2 nights. Participants also downloaded a mood-monitoring app on their smartphones that quizzed them about their moods at random times every hour throughout the day, both when participants were at work and at home. The participants worked in four different office buildings and occupied a variety of positions within the GSA. Sampling a wide range of workers and office types was important to the researchers because it meant their findings could apply broadly to many types of workers outside of the GSA. The study produced some results the fell in line with previous findings: Those employees who worked mainly on computers moved around during the day less than did those who didn’t work computer-based jobs. Older workers and those with higher body-mass indices (BMI) were less active than their younger, lower-BMI colleagues. The researchers also found some associations they had not anticipated. People working at long open tables (the arrangement found in many open office designs) were 20% more active than were cubicle workers, and 32% more active than were people who worked in their own offices. “It is possible that the open nature of a space leads to increased physical activity by encouraging interaction and mobility, including movement to spaces designed for unplanned meetings and phone calls, when available,” Lindberg and colleagues write. They also suggest that workers may need to make use of shared spaces more in open-bench arrangements since they are less likely to have their own printers or spaces for scheduled meetings. The researchers also found that cubicle- and office-bound employees had higher self-rated stress at work, and higher physiological indicators of stress (via heart rate monitors) at home after work. The researchers speculate that higher stress could be caused by lower activity levels, and previous research supports this notion. This research sheds light on the ways in which office design can impact employee wellbeing. Although employees generally like to have their own offices, employers often prefer to consolidate employees to save space and money. The GSA is hoping to use findings from this line of research to balance various concerns and perspectives as they plan future office space designs and redesigns of existing spaces. Kirk, M. A., & Rhodes, R. E. (2011). Occupation correlates of adults’ participation in leisure-time physical activity: A systematic review. American Journal of Preventive Medicine, 40(4), 476-485. doi:10.1016/j.amepre.2010.12.015. Very hard to believe…I’ve worked in various office environments, and open is the worst. Absolute rubbish. Open offices are distracting, destroy any privacy and ruin productivity.